D-Link has started shipping the first router in a series of new high-performance 11AC home networking solutions. Ushering in the bold new look of D-Link® home networking, the DIR-890L ULTRA Performance Series of 11AC Wi-Fi Routers are built with the speed, coverage and processing power needed to support the most bandwidth-demanding applications and devices. The ULTRA Performance Series delivers chart-topping wireless speeds up to 5.3 Gbps, far-reaching coverage, a revamped and intuitive user interface, and dynamic Smart Connect to automatically balance clients, giving users more control over their network than ever before. 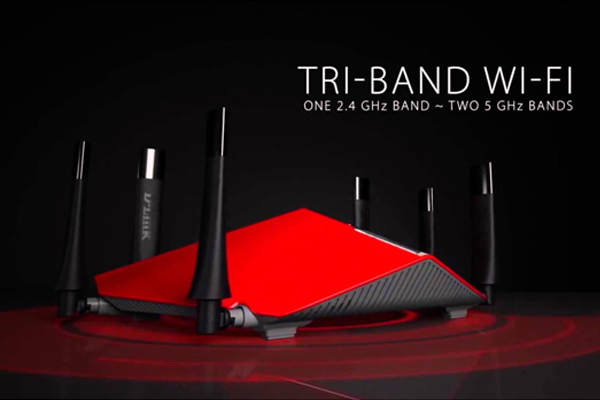 The ULTRA Performance Series from D-Link brings an aggressive and stylish design to home networking with a premium red finish (in addition to the standard black) designed to match the ultra-performance delivered by these new routers. In addition, the series’ sleek form factor features a broad base with angular points and high-powered antennas to offer extreme performance in a modern form-factor for today’s homes. The new series of routers is equipped with a wide array of advanced features including Wireless 11AC Beamforming to enhance signal strength and throughput, Smart Connect to automatically assign clients to the wireless band providing the best bandwidth and an advanced QoS engine with a drag-and-drop UI to provide an easy way to prioritize applications and devices. In addition, the routers feature gigabit WAN/LAN Ethernet ports for high speed wired connectivity and are enabled with WPA™ or WPA2™ security and Wi-Fi Protected setup to ensure network integrity and ease-of-setup. Each router is fitted with six high power antennas, designed to maximize range and optimize coverage. The DIR-890L ULTRA Performance Series Wi-Fi router also features D-Link’s latest user interface, making it easier than ever to control a network right from a smartphone or tablet device with touch-friendly layout. Enabling parental controls, blocking unwanted devices, monitoring internet activity and creating Wi-Fi guest networks has never been simpler. The routers also support simple setup using a mobile phone or tablet with the free Quick Router Setup (QRS) app.